Are there ever times when you smell something and a memory comes back to mind? Sometimes when I smell cinnamon I start reminiscing on the comforts of home. In thinking about cinnamon most people will readily think cinnamon rolls as they have gained popularity from a well known bakery chain. 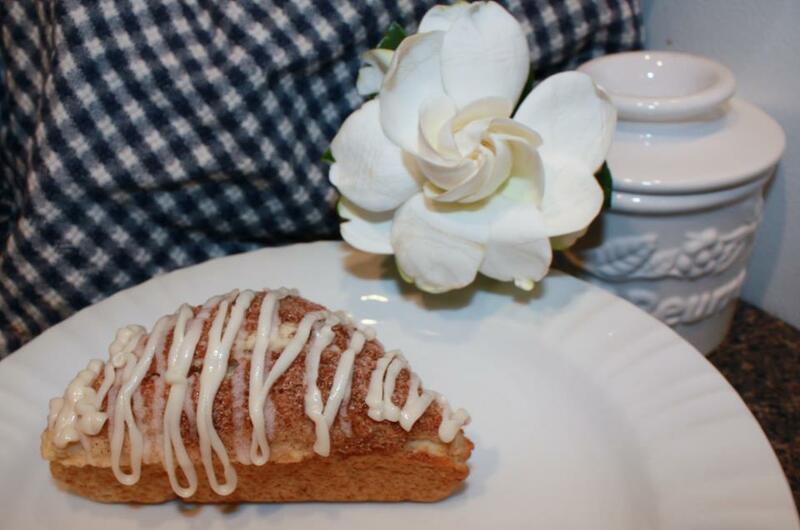 Have you ever thought about cinnamon scones tho? The other day I decided to use my newly purchased scone pan and I made cinnamon scones. Granted I didn't follow the recipe in its entirety and while I'm giving credit to the recipe, I'll share my tweaked version below. In a large bowl, mix together the flour, 2 TBSP sugar, brown sugar, 1/4 tsp cinnamon, baking powder and salt. Add the butter and work into the flour mixture, using a pastry blender, until the butter and flour form pea size balls. Add vanilla, egg and 1/2 cup of the heavy cream. Mix together. If the dough is too dry, continue mixing and adding more cream 1 Tbsp at a time in small increments until a pliable dough has formed. If you have a scone pan, evenly divide the dough amongst the pan and press into place. Otherwise dump dough onto a floured surface and form into about an inch tall rectangle. Cut into triangles. Brush the tops with more heavy cream. In a small bowl, mix together the remaining 1/2 tsp cinnamon and 2 Tbsp sugar. Sprinkle mixture on top of scones. *I used a Four roses bourbon, mixed with butter, vanilla, and powdered sugar for a buttery bourbon vanilla glaze - it was incredible!